Bremen - Enter Silence. Vinyl LP. Bleep. Uppsala duo Bremen drop their fourth LP, and the third they’ve released via Blackest Ever Black. 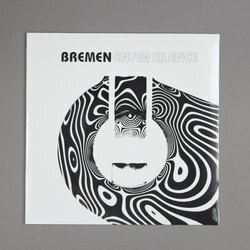 Anyone familiar with the wide-ranging Krautrock style that the group showed off on albums like Second Launch will be pleased with what’s on offer over the course of Enter Silence. The instrumental numbers here take in Cankun-esque psych-looping (‘Closures’, ‘Sinister’), strutting rock tunes that almost verge on proto-punk (‘Aimless Cruising’) and good old Motorik grooves (‘Too Cold For Your Eyes’).